Max- 55 Years as on date of receipt of Application. Post Graduate from a reputed institute. 8 Years, including at least 5 years in product and/or portfolio management preferably in Personal Loans and/or Credit Cards. 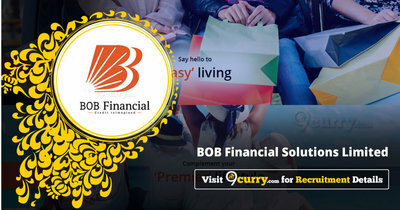 Eligible candidates may email to careers@bobfinancial.com with the subject as “Personal Loan & Portfolio Management (Retention)” on or before 24 Apr 2019.